Our heat transfer printing process is as easy as 1-2-3. Select a t-shirt or apparel you need printing on. We also have an exclusive line of promotional items we can also print onto. Check out our promo items in our store. 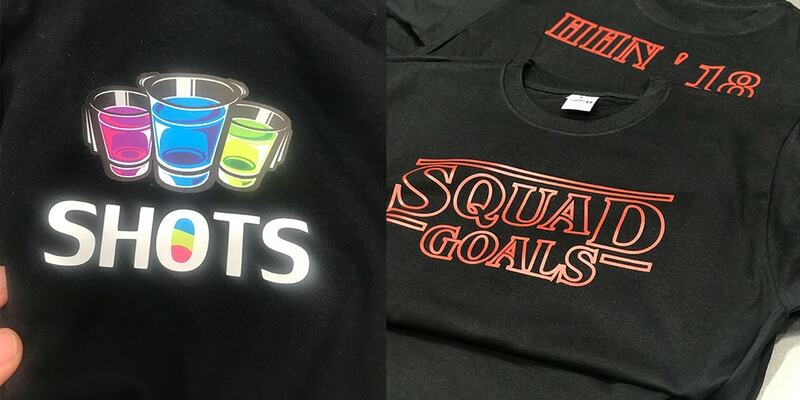 We can use our heat transfer prints and apply them to several products like t-shirts, hoodies, koozies, tote bags and more. Add a design. Let your imagination flow with our full color direct to garment prints or simply have a single color cost-effective t-shirt design. our design team can help you come up with a Free design idea if you can’t seem to figure out a good design on your own. Our design tool is easy to use and gives you an idea of how the finished shirt will look. Review of design. Our team will then look over the design, make sure it does not have any conflict for the heat transfer process. We make sure it won’t have any issues when weeding the vinyl, the designs resolution is high enough so you don’t get uneven edges on your design and so on. This process is just a few hours and then we are on our way to print! we start printing the vinyl transfers or sublimation prints depending on the heat transfer service we are offering you. In the meantime, our print shop managers prepare the shirts for the heat press machine. They make sure that the color & sizes match up with the right design. This is very important for personalized team shirts. 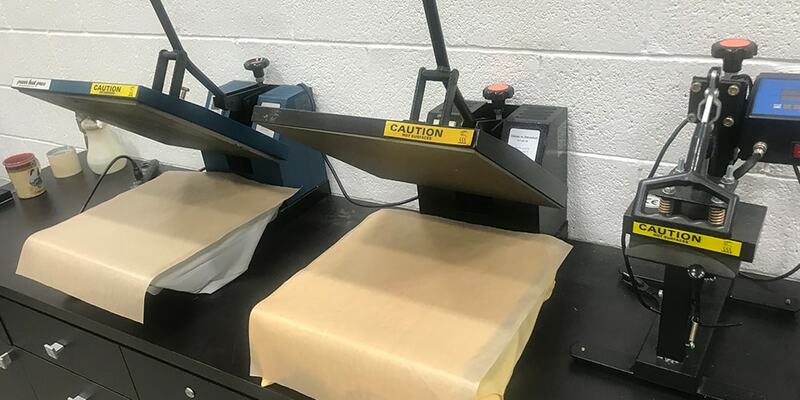 Prints are applied to your product with our heat press machines. Depending on the print we adjust the pressure and heat of the machine to make sure you get a crisp finish on your product. Heat transfer printing is applied very differently to each kind of product. The temperature that we use ranges from 250 degrees to almost 400 degrees. We also do not cut corners and heat press every t-shirt twice! Yes, you heard us right, we do it twice to make sure that the ink is applied deep into the fabric and will last. We strive to make every customer happy, making sure they get their finished product exactly how they wanted it printed. Our heat transfer printing service covers several printing processes. Vinyl lettering, vinyl transfers, full-color sublimation, foil printing, direct to garment and more. Check out a few of our cool designs we have printed in the past for our customers. What kind of materials can you heat press? Can I make personalized orders? Absolutely! We can print custom names and numbers for teams with our vinyl plotter. Many customers also love to do custom shirts for birthday parties, it’s a great memorabilia to make and give away! How fast can you make a custom transfer t-shirt order? A standard order will take 7 to 10 days in production and then shipped out with free shipping. Now, we do offer rush order services on t-shirts. In as soon as 48 hours we can have them printed and in your hands.